As for 2007/08, there were no fatalities in 2008/09, compared with two in 2006/07 and 2005/06. There was an estimated 28,224 offshore workers in 2008/09, an increase of 0.33% on the 2007/08 estimate of 28132 workers. These figures were obtained from an industry-based data source1. The combined fatal and major injury rate reduced to 106.29 per 100,000 workers in 2008/09 compared to 156.41 in 2007/8 and 145.51 in 2006/07. Based on the workforce figure of 28,224 workers, the over-3-day injury rate per 100,000 workers (496) for 2008/09 shows an 5.7% fall on that recorded for 2007/08 (526.1) and is a new low. 26% of injuries were to parts of the foot and lower limbs and over 19% to the back and torso area. The total number of cases of offshore ill health reported was 21, an increase of 15 on the previous year. The main disease reported was chickenpox with 7 incidents (up 3 on last year). Occupational health conditions included 4 cases of hand-arm vibration and 3 cases of occupational dermatitis. 478 dangerous occurrences (including well incidents) were reported. Main types of dangerous occurrences reported were Hydrocarbon releases (33%), fail equipment offshore (28%) fail well (9.4%) and lift related (8.4%). There was a significant reduction in the total number of Major and Significant HCRs (61) in 2008/09 compared to the previous year’s total of 74. 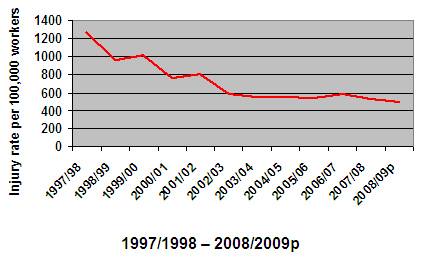 Major HCRs reduced in 2008/09 to 1 the lowest on record. 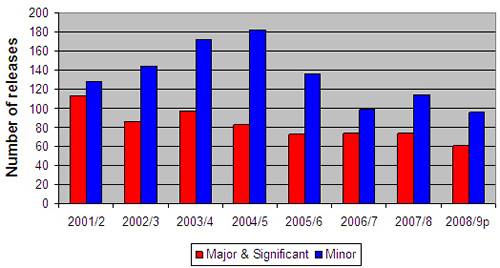 The number of minor HCRs declined in 2008/09 (96) compared to 2007/08 (114). 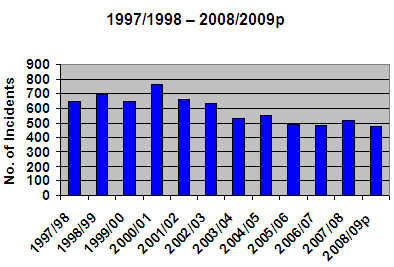 Overall the total number of releases fell in 2008/09 to the lowest number recorded (157). A further breakdown of the headline figures contained in this Bulletin will be provided later this year in the annual Offshore Injury and Incident Statistics Report, produced as part of the HID Statistics Report (HSR) series of publications. 1 Provisional data extracted from Vantage system via StepChange in Safety. 2 Upper limb includes finger/thumbs, hand, wrist and rest of upper limb. 3 Fractures to fingers, thumbs or toes are classed as over-3-day injuries and not as major injuries unless hospitalised over 24 hrs. 4 Upper limb includes finger/thumbs, hand, wrist and rest of upper limb.